I’m back after being ill for too many days. But when I was at my lowest point, this arrived!…. 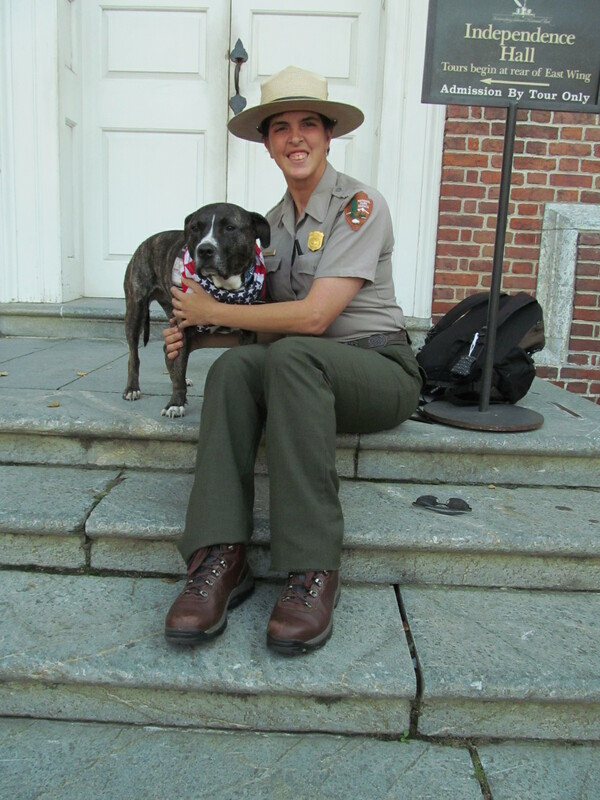 Ruby’s message isn’t so much “See what a pit bull can do!” as it is “See what wonderful things can happen with a rescue dog.” Ruby’s accomplishments shouldn’t be seen as an aberration…..a one in a million dog with the “Right Stuff”. 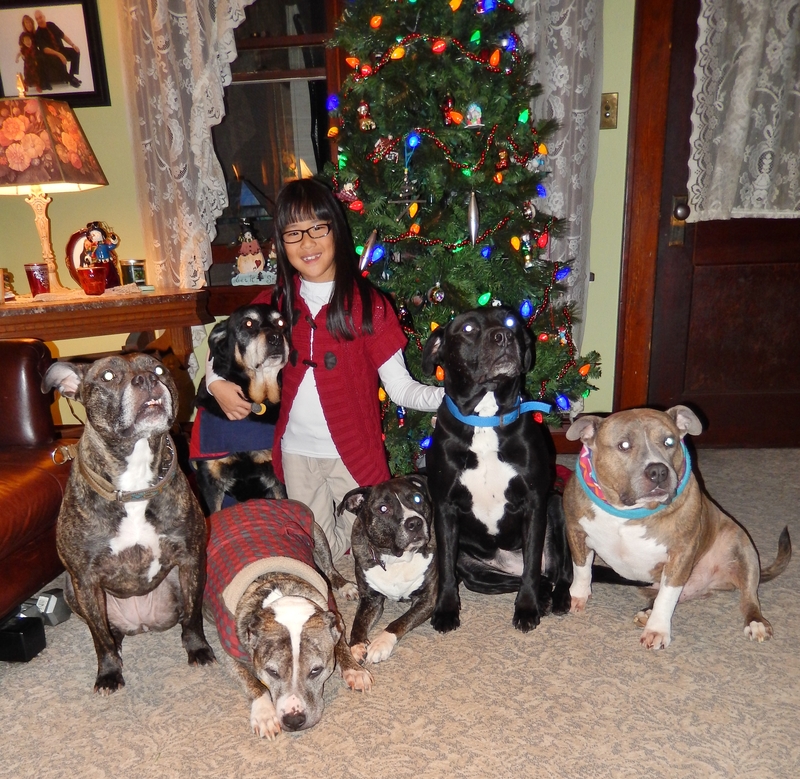 There are countless legions of dogs who could do the same thing to one degree or another…..never mind the breed. Of course it comes down the the individual dog and it’s personality. Okay, I’ll admit, Ruby seems to a have a unique combination to traits that work well together. But then, so do a lot of dogs. The big difference is that She has been given the time, the training and the opportunity to blaze one hell of a trail…This is not rocket science. Every minute a person spends time developing a relationship with their dog….Every hour spent in a obedience class with that furry family member, returns big dividends and worth every ounce of effort. 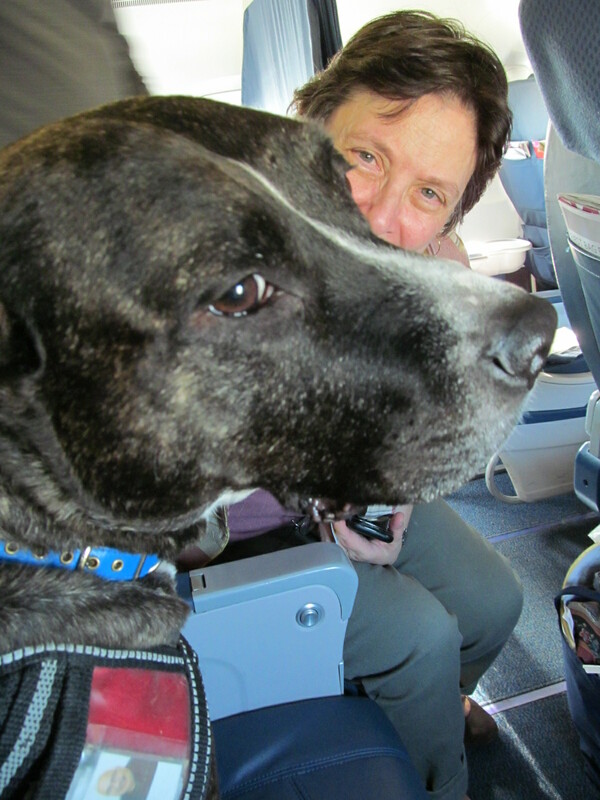 On a flight home from Philadelphia, This recent widow was thrilled to have Ruby in the middle seat! 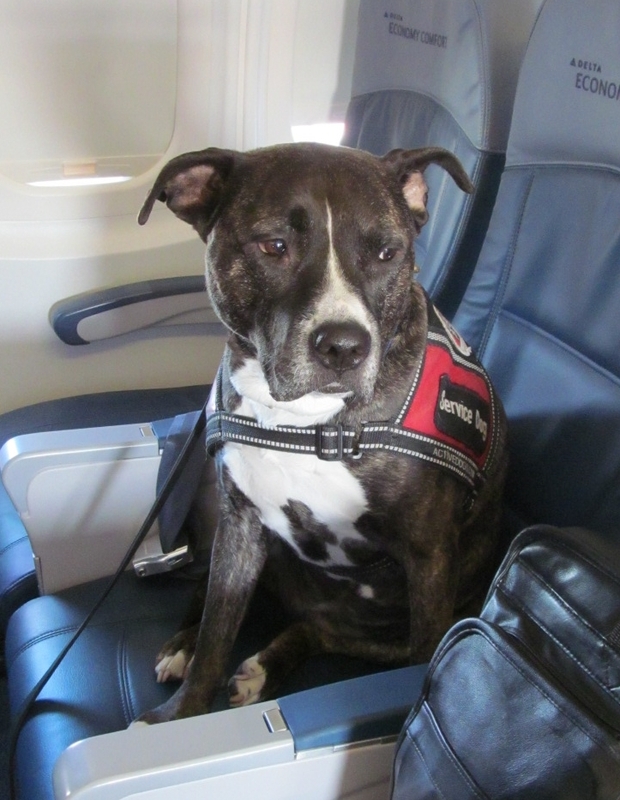 Depending on who flies us, Ruby sometimes get her own seat. Other times she is at my feet. 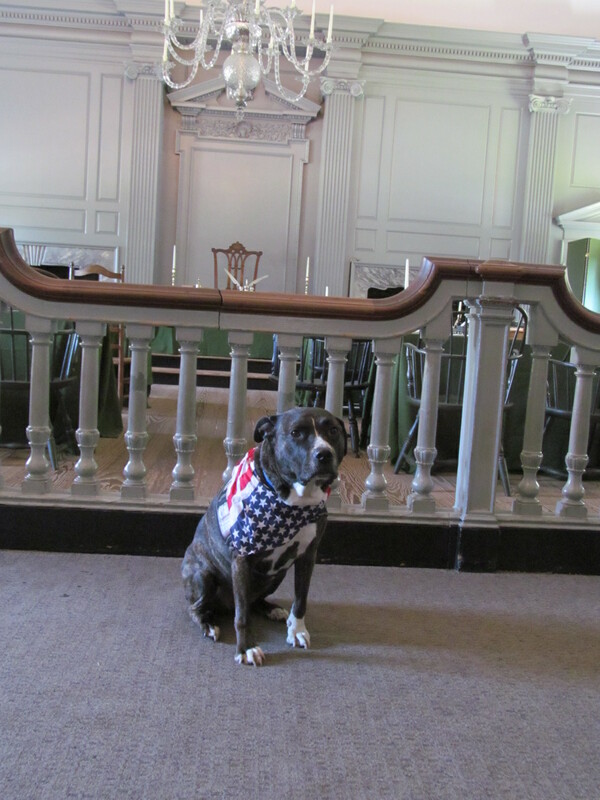 Independence Hall in Philly. The Ranger held back the next tour group so I could get a quick shot of the Rubster. The little Diva even had her own driver! They say a picture is worth a thousand words…..If that’s true, and it does seem to make sense, I’ll save a ton of writing on this post and let the pictures speak for them selves. 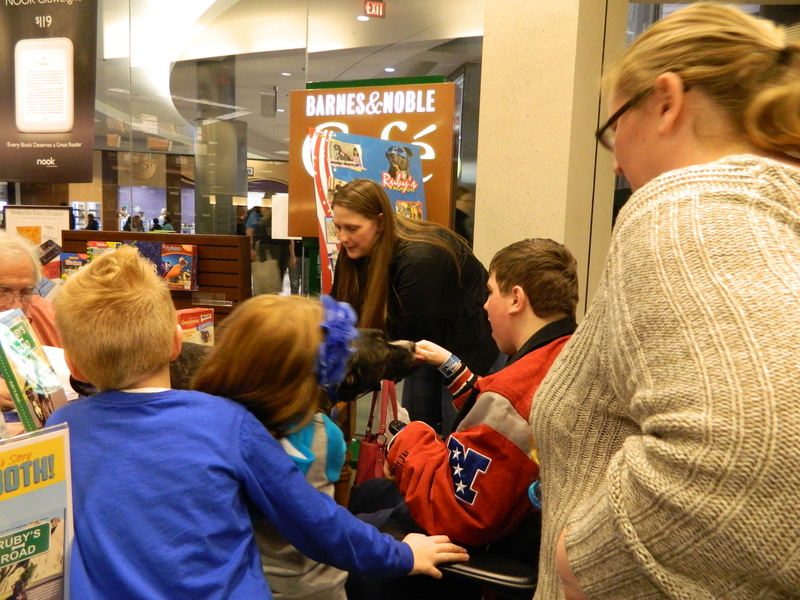 So then, here is the “Rubster” in her super calm demeanor, doing her job at books signings, schools, libraries and senior citizen residences. 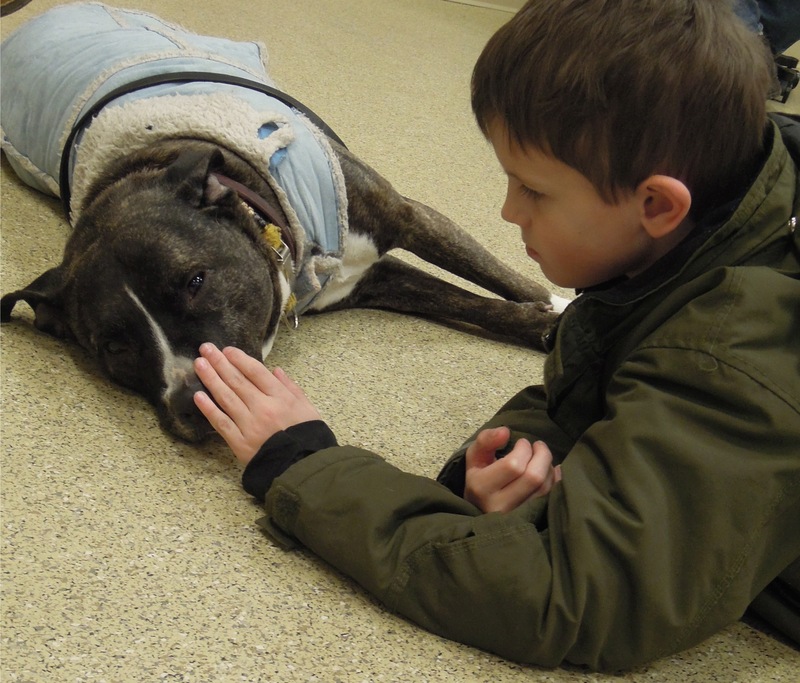 One dog saved and making a difference…..Foster, Adopt, Volunteer. 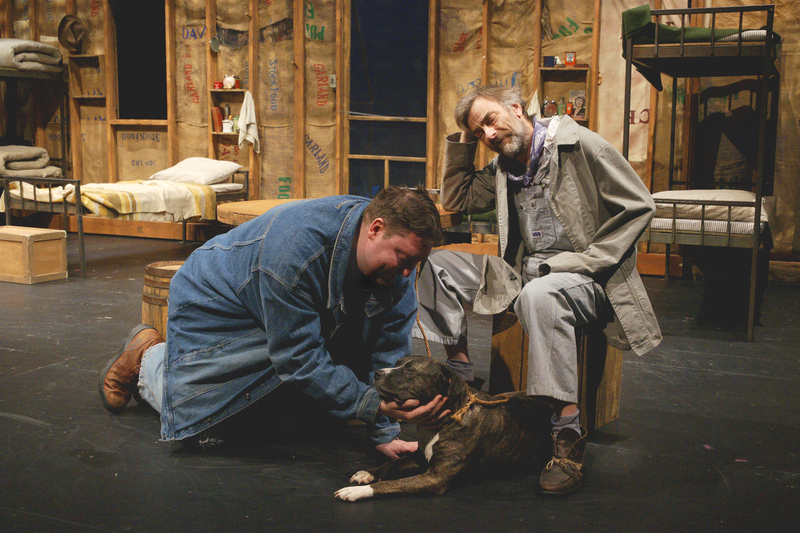 You can make a difference!…in a dog’s life….In your life, and who knows where it can go? Stayed tuned, coming up: more Photos! 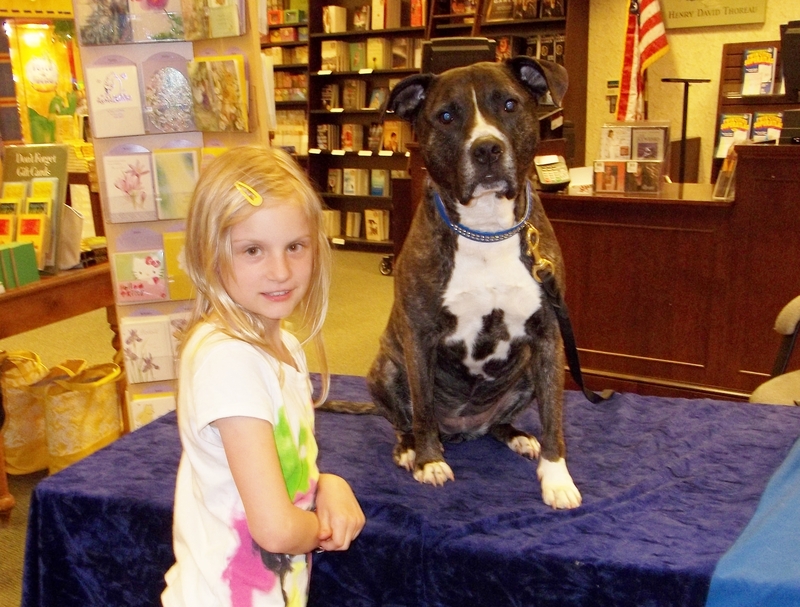 Mall Of America Barnes & Noble…This young Lass is a cancer survivor. 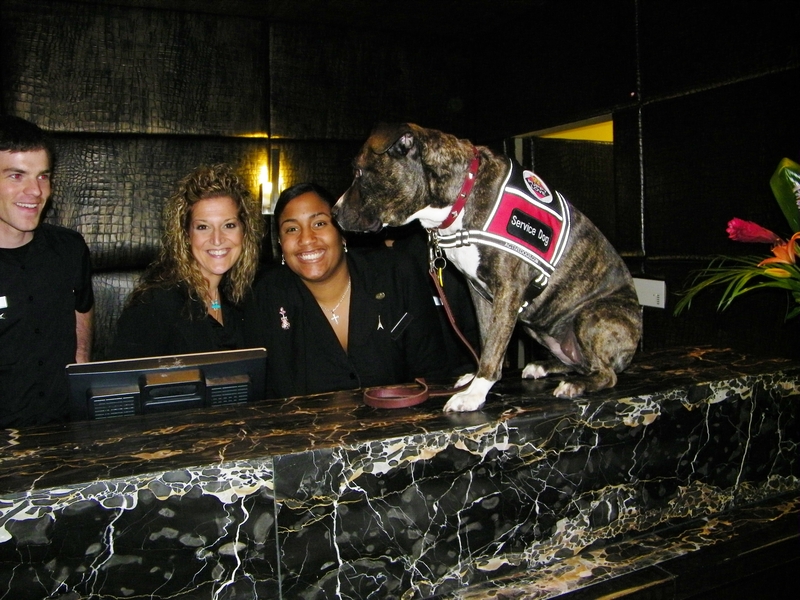 She wanted to meet Ruby, who is also a survivor. 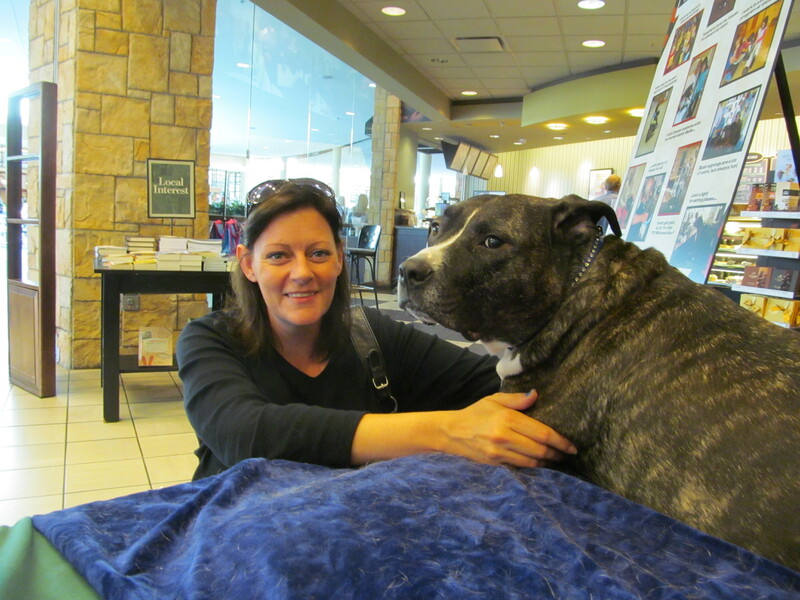 Rochester Minnesota….This dear woman’s dog had just passed away. She spent a lot of time with Ruby. A happy “Ruby Groupie” discovered Ruby’s van in a Barnes & Nobel parking lot. 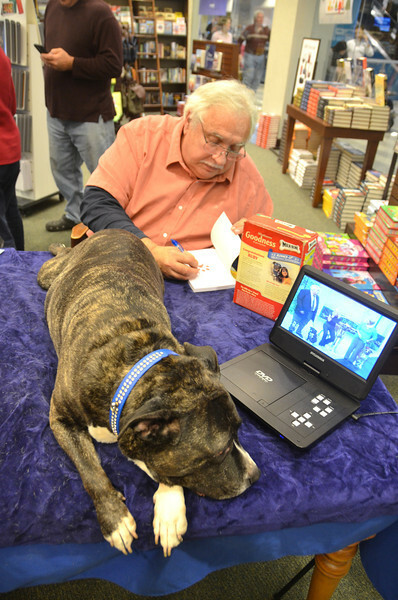 Ruby chills while I sign a book…. 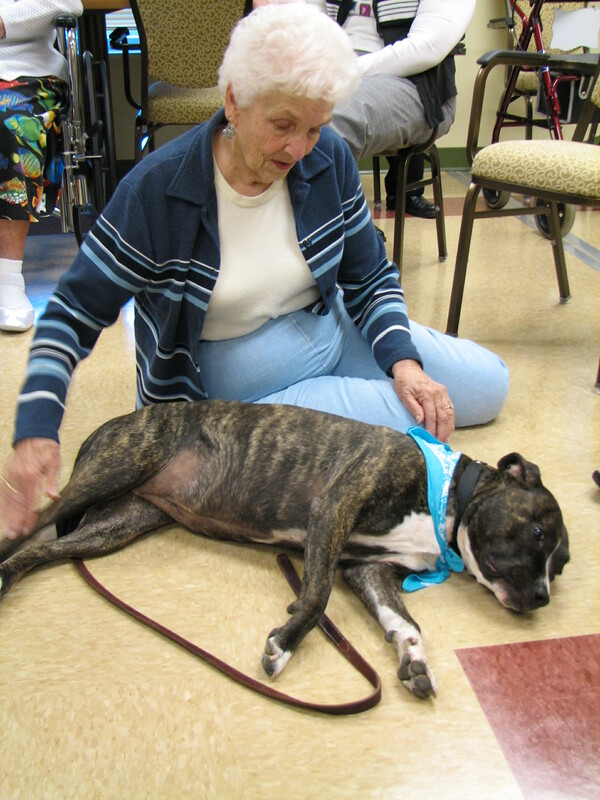 This lovely senior insisted on getting down on the floor with Ruby. It was her favorite thing to do when she had a dog. 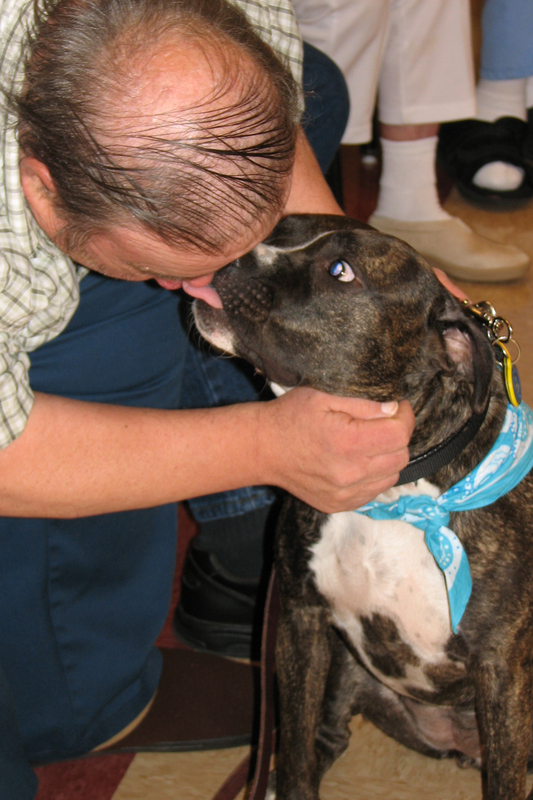 Always time for a kiss….Just ask! Let’s continue, as I attempt to bring folks who may not be familiar with Ruby’s story up to date. Can’t believe my little girl is going on eleven years old! We have had a hell of a run at life together! So many adventures over the years, and that time has flown by with terrifying speed. But I have memories with her that will be with me till my last day. Ruby’s multifaceted involvement in the community leaves me breathless. Her resume’ reads far better than my own. 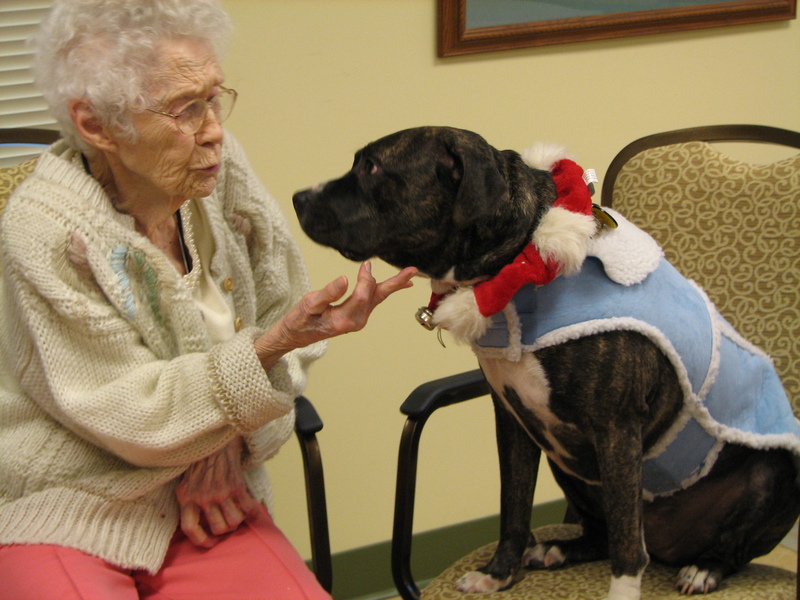 A a therapy dog, Ruby visits senior residences, and nursing homes, hospitals, hospice, rehab centers. 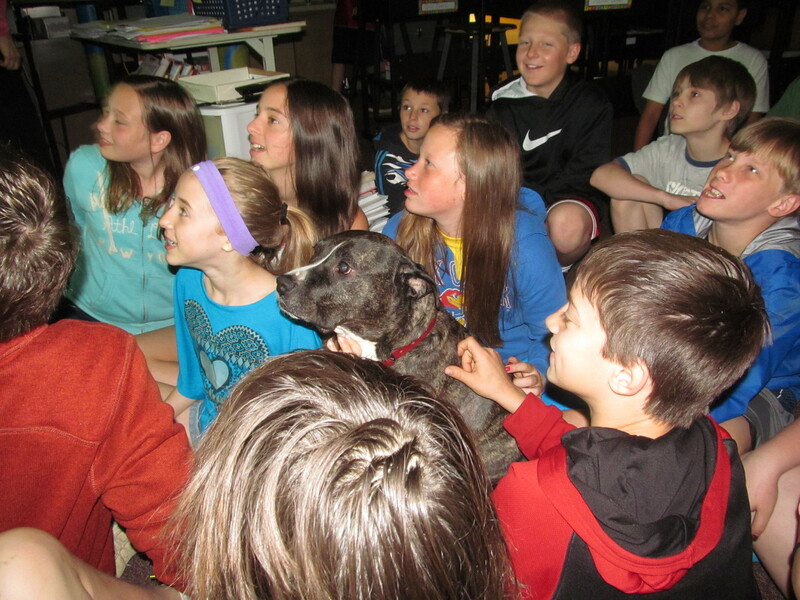 She works with special needs children, and visits schools to talk about dog safety, humane treatment of animals and rescue. 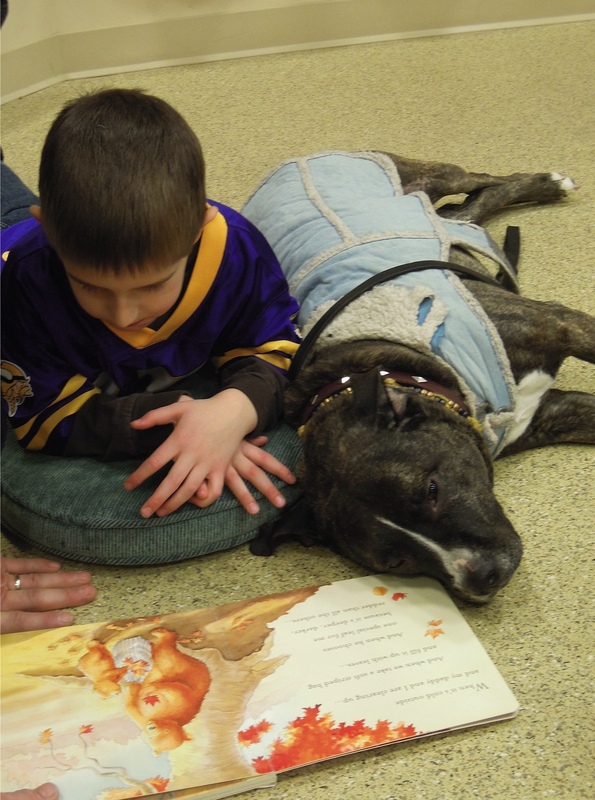 Works with kids in “Read to a dog” programs at schools and libraries. 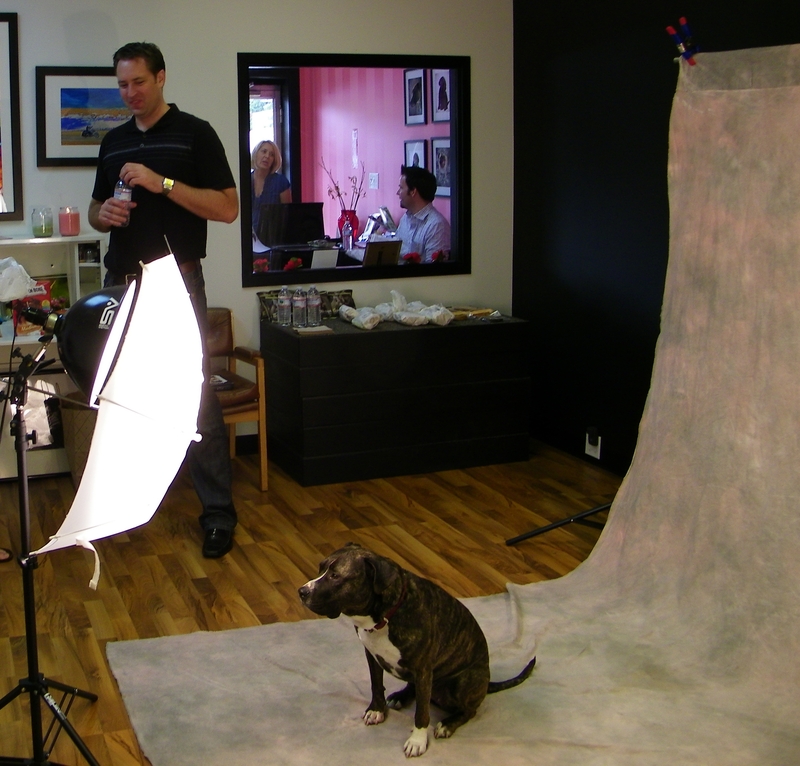 Ruby has made personal appearances around the U.S to campaign against Breed specific legislation at symposiums. 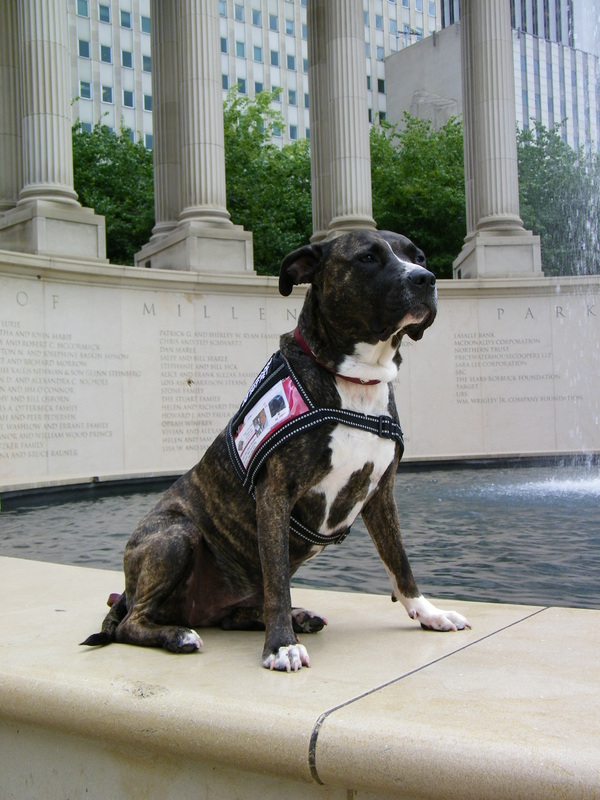 She also does fund raisers and book “Paw Printing events”. (72 of so far) She has also donated hundreds of her books to animal rescue groups to auction off, schools and military personal in harms way. But my heart is breaking for Ruby as she is showing her age more dramatically, than say Tiger who at sixteen has had an almost abnormally healthy life since his rescue. Ruby, with her cancer surgeries, two disintegrating discs, thyroid issues, loss of muscle mass and most recently, concern over her enlarged spleen, is becoming frail. Happily, she gathers up her strength and has an occasional case of the “zoomies” in the back yard or attacks a squeaky toy like a Rat Terrier. These episodes don’t last long and then she is done-in for the day. But how fun it is to see Ruby flash past, grab a ball, tease me and run off seemingly free of pain. 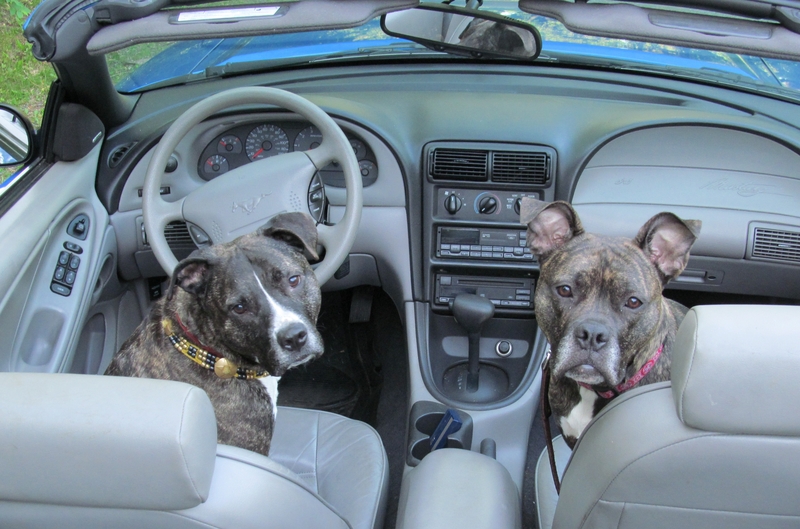 And now, the final two…..
As we continue to share our furry family members, these two characters complete the “Tribe” as we are called….That nickname goes back a ways. I’m still a little fuzzy on how it got started, but someone compared us to the tribes on the television show “Survivor”. Anyway, meet Sugar and Blue…..
Our newest and youngest tribe member has her own chapter, so I won’t share a lot here except to say she has been a mostly hilarious addition to our family. Sugar has her own distinct personality to be sure. From those crazy ears, goofy teeth and gorilla eyes, to her involvement in everything in this big wonderful world, and the funny sound she makes when she’s excited—kind of a “ffffitt”— Sugar keeps us human members of the tribe well entertained. The other canines? . . . They’ve done a great job of putting up with her youthful exuberance. Us humans? You just can’t stay mad at that face! Oh, there have been times when she’s earned our displeasure, mostly when she has attempted to rise to Alpha position. Not only Ruby, but the other dogs take a dim view of this. And Sugar quickly discovered Ruby has other, higher ranking allies. Lynn and Me! While, she has been slower to mature and find her wisdom than Ruby did, Sugar possesses deep intelligence and is doing exceptionally well in obedience classes. In some things, she does far better than the Rubster. Then there are her eyes that so often have the expression of working an angle, figuring things out. You dog owners know what I mean. Her skills with people and other dogs are exquisite. Someday Sugar will carry the torch for Ruby, but in the meantime there is much to learn from the master. . . We’ll soon share Sugar’s unique rescue and most interesting attempt to adopt her out. Never can stay mad at Sugar more than a few moments… Luckily, she’s a good dog. Blue is a first rate snuggling couch potato. He doesn’t like to put out too much effort for fear of losing weight. Brrringgg! I answered the phone. 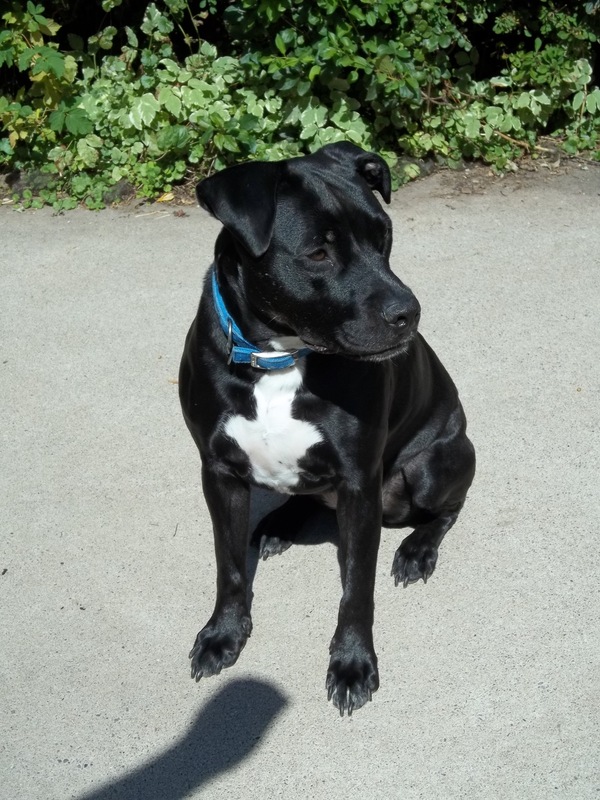 Hmmm, this would not be the first dog Dana has talked us into fostering or adopting. Ruby comes to mind, for instance. I told her I would check with Lynn and get back to her. Within five minutes I had an answer. 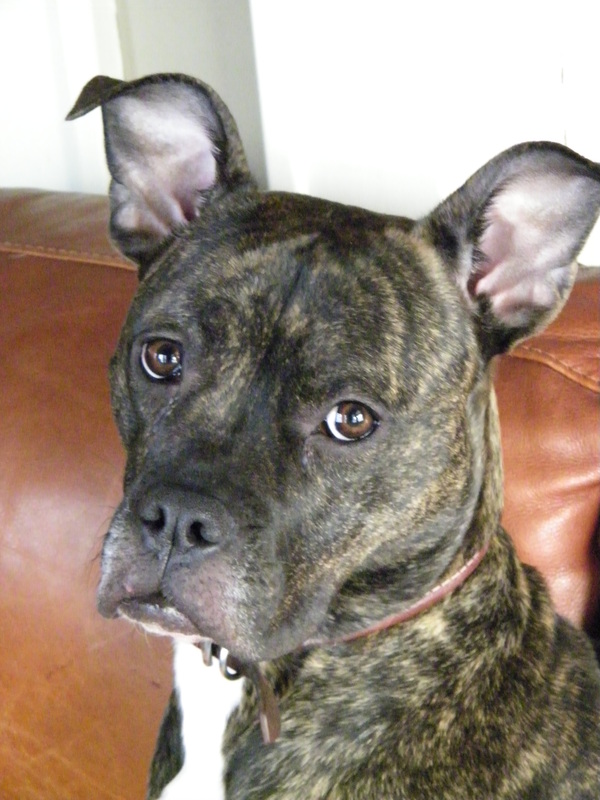 Lynn had readily said yes, but this time positively only as a foster. Blue came in from another state, so we met the transporter about an hour’s drive from our house. 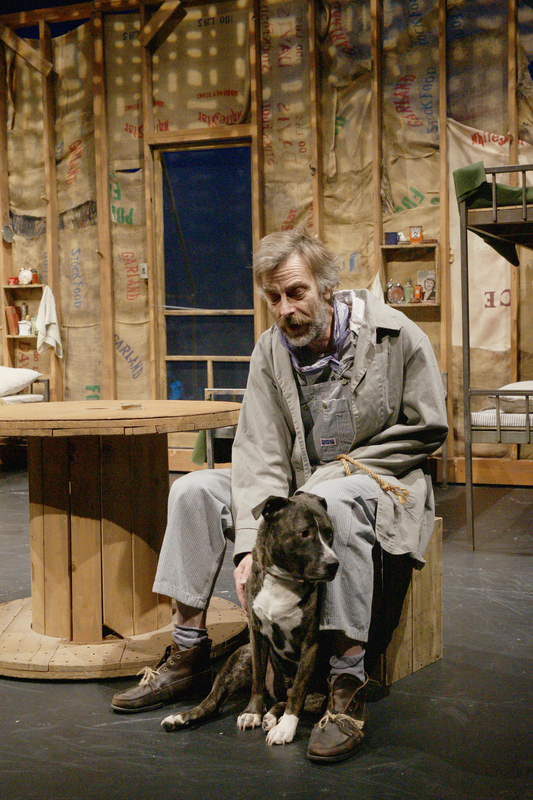 The driver helped him down out of his crate – what a sight to behold! Sure, he was happy, cheerful, gentlemanly, and certainly laid back; but it was his physical appearance that took us by surprise. We had seen pictures, but they did nothing to prepare us for meeting him in the flesh . . . errr . . . fur. He was STOUT! Massive muscles through the shoulders, back, chest and neck. Blue’s head was approaching the size of a bowling ball. He was wide. . . You could land an f-14 on that back for crying out loud! Yet his legs were ridiculously short. They sort of looked like little thick pegs. Blue was both imposing and a cartoon character. We were in awe and giggled at the same time as Sadie piped up “He’s put together like the Tasmanian Devil on TV!” That pretty much summed it up. 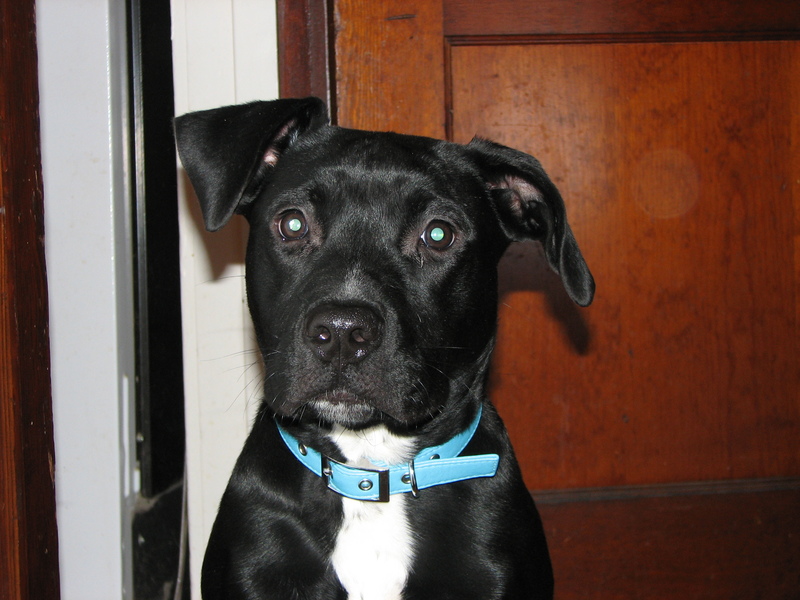 Except, that he was also one of the kindest, sweetest dogs I had ever met. We understood that losing their family and being thrown into a facility is traumatic for a dog; and many times their full personality doesn’t come out for weeks or even months. But there was something about this boy that told us what we were seeing was what we were getting. I mean fostering. As with Tiger many years before, Lynn’s eyes washed over Blue again and again, surveying every movement, every nuance. She spoke first. “I think we should keep him.” Yikes! I nearly snapped my neck to look over at Lynn. She wanted a rescued Rottie as our next dog, and besides we weren’t quite ready. Unbelievably, uncharacteristically of me, I was the one who back-pedaled on keeping him! . . . At least for a little while. He seemed to be relatively well cared for; most certainly, Blue was well fed. Although he was brought in with fleas and some fractured teeth, it appeared that he wasn’t physically abused. Each day brought a delight and a surprise. The lovable lug was beautifully crate-trained, house-broken, trained to go potty while on a leash and comes immediately when called . . . a great help when traveling! He loved riding in the car and cut quite a figure peering out the window of the back seat, looking every bit the school boy. His kind, sweet personality shines through and that calm, steady demeanor makes him a joy to be around. An odd thing, Blue is camera shy, or simply doesn’t like them. If he is outdoors and something has his attention, no problem, I can snap away. Indoors is another matter. He will turn his back to me every time he spots a camera in my hand. 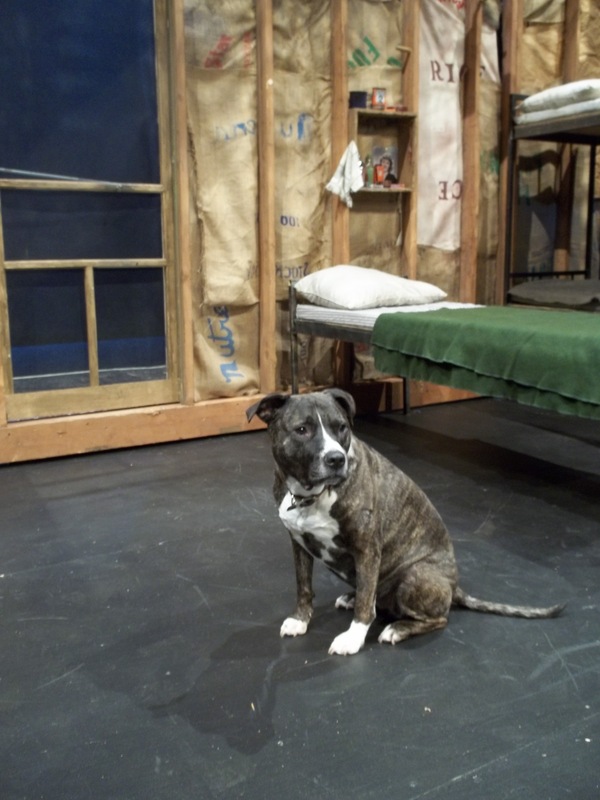 The other evening as Lynn was sitting on the floor with Mr. ‘Stubby’, she called out to me in another room—“Bring the camera quick!” The second I entered the area, Blue got up with a heavy sigh and left the room. When I left, he returned immediately but kept a watchful eye out for this Paparazzi. I don’t know what his living conditions were, but Blue seems amazed at the world around him as he studies everything so carefully with a soft curiosity. Not one of the other Tribe members felt threatened by the big gentle soul, but still, Blue would live in the ‘Penthouse’, a finished-off room above the garage until his slow transition into our house with the “Tribe” was complete. That transition only took about two weeks, and it was a done deal. Blue had become part of us. He wasn’t going anywhere. Welcome home Mr. Blue. But there is more . . . the backstory of his being saved twice. It’s a story worth re-telling. 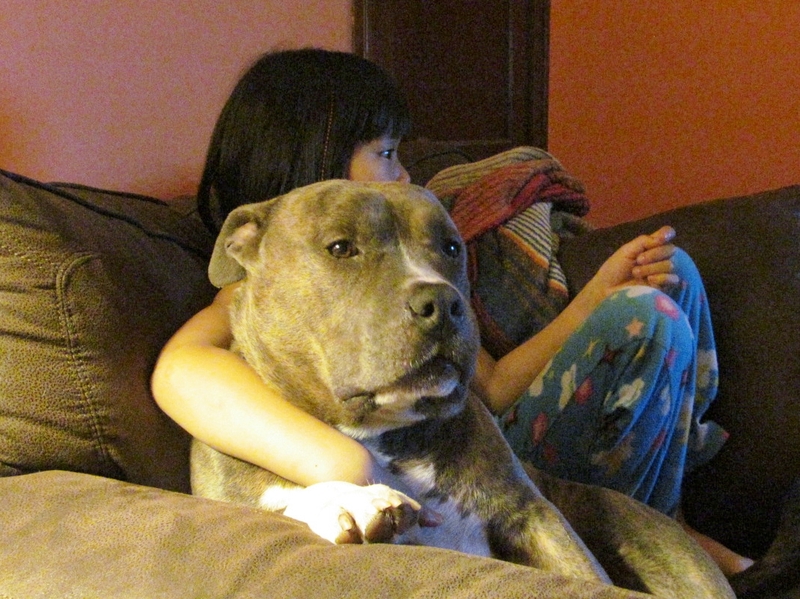 We’ve already established Blue was spirited out of a city that had laws against owning his breed. 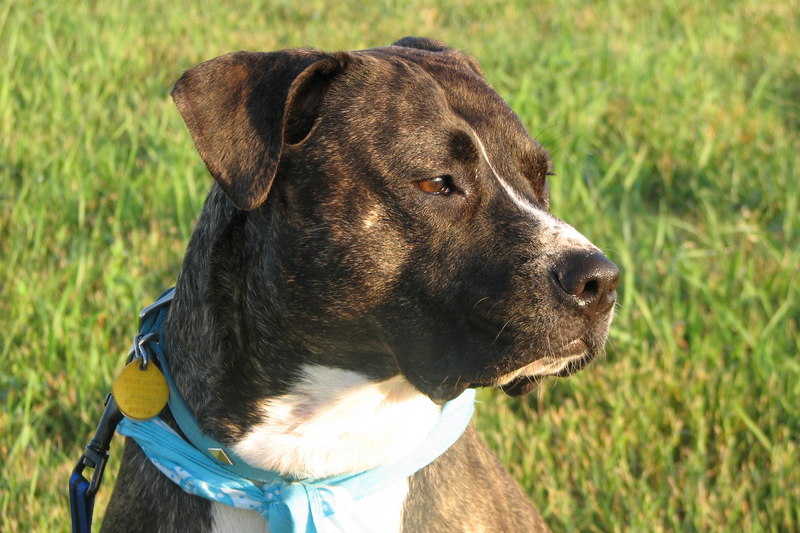 The Humane Society that temporarily took in Blue had to find him a good, safe, loving home. If it weren’t for the employees of that organization, poor Blue might well have met a fate far worse than death by a needle. Just a few days before we agreed to foster the big boy, a small group of some ‘very unsavory’ types came in to adopt him. Judging by their blatant conversation about Blue’s future, a nervous, but brave employee refused to adopt him out. They left, but as the employees watched through the window, they observed the group of young men that just tried to get Blue talking to their buddies in the parking lot. The second bunch came in and they were just as unsavory; and her answer was the same . . . No dice! Now everyone left. But they weren’t finished. They returned later that day, and this time they numbered fifteen by her count. They tried to intimidate, bully and cajole her into giving up Blue. It speaks volumes about her integrity and courage that she stood her ground and refused to budge. When they left, the employee immediately had our future family member locked in a special room where just a select few had the key. Blue was on his way home . . . to our home. So there you have it—our tribe, our pack, our furry family. We have no illusions. Most of our tribe is rapidly aging and we are bracing ourselves for the dramatic changes that will and must come with the passage of time. It won’t make it any easier. We have lost entire families over the years before and know well the terrible, empty pain . . . the hollow feeling in the heart. If you’ve ever loved a pet, you know exactly what I mean. In the end, it will have been a pleasure to know each one of them and an honor that we were able to share their lives. . . .
Time to meet another furry family member…. dogs.” People just seemed to have heard about us. Molly was found by a couple, not far from their home in St.
dogs didn’t like her. Taking Molly to the shelter wasn’t an option. likely she would be put down. “We know you have class tonight. The comment was met with faint smiles and half-hearted nods. Whew! The attack left me swaying like a punch-drunk pugilist. That did it! I thought of our family snug in our beds at night. of me every night, every day, every time I . . . Oh hell! All the time! All right. Okay, you can stop now. I’ll take the dog! up for my indiscretion by deep-cleaning and reorganizing the house. when she returned. She did appreciate my efforts, though. class dressed for comfort in a nice comfy sweatshirt and sweatpants. moment during class, Molly jumped on Kathy as if to say, “Hey! Okay, so she was cute! But adopting her was out of the question. As we bring you up to speed on our Tribe, here is a little bio on each of our foster failures. And while Ruby’s accomplishments have captured the most headlines, each one is a valued family member….A spoke in our wheel. We love them all! Lynn’s feet all day as Lynn telecommuted in her front porch office. Life was good for Carla. Carla was then struck with Katie passing away eight months later. he was a fan of the breed, understanding her sad tale. heartbreaking and the damndest thing I had ever seen. too much television and doesn’t much care for dogs on the screen. who sneak up on something. This is met with a low, nasty growl. side, so we live each day grateful to have her back. wrestling, with his tail wagging and mouth agape in a big happy smile. behaved like an excited young boy. Reality quickly followed. “Patrick, are you out of your mind?! I slunked away, defeated, to pout for awhile. disseminate fact from fiction from urban legends. and were off to meet some friends at a dog show in downtown St.
fall into the “What were we thinking?” category. they had a quick meet and greet. The two got along like fast friends. shouldn’t be left alone together. out as if he had run a marathon. “That dog doesn’t belong here. instant answer and sugary sweet concern, he was confused. “Oh,” they both seemed satisfied. who have my image in their mind’s eye as a rogue and a liar. in the coming months and years we caught glimpses. Motorcycles. until it disappeared. It was a sad sight to see. manipulate them. This was just one of the unsolved mysteries of Tiger. a couple of weeks before things were more or less back to normal. on a hodgepodge skeletal frame no doubt caused by bad breeding. Tiger lived up to his namesake, very cat-like and independent. everything is okay…..Next post, you’ll meet more family members! had to be put up elsewhere. 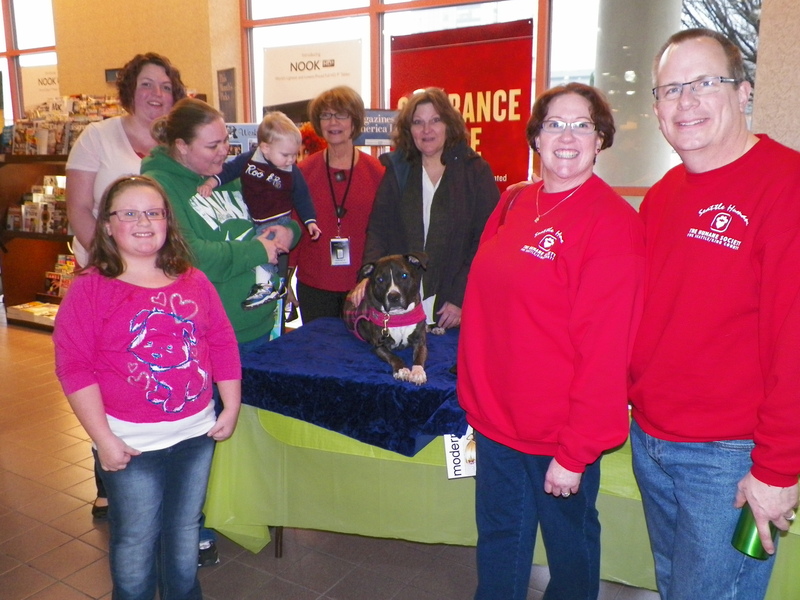 Could we take Ruby the pit bull just for the holiday? Lynn was firm. No! Sorry, but we’re slammed, too. Lynn’s resistance had been worn down. She reluctantly agreed. I naturally professed agreement. Lynn had a legitimate point. I let Ruby out of her cage. people on the couch, carefully turned to face the room, and sat quietly. was as if she were formulating some kind of plan. “If I play my paws right, I’ll be running this place in six months. business seems to be working on the humans around here. turning. We thought it was a hoot. care in general. Lynn was always the practical one about such things. “She is awfully nice.” A long pause. “Oh sure, what’s one more? It was a done deal! 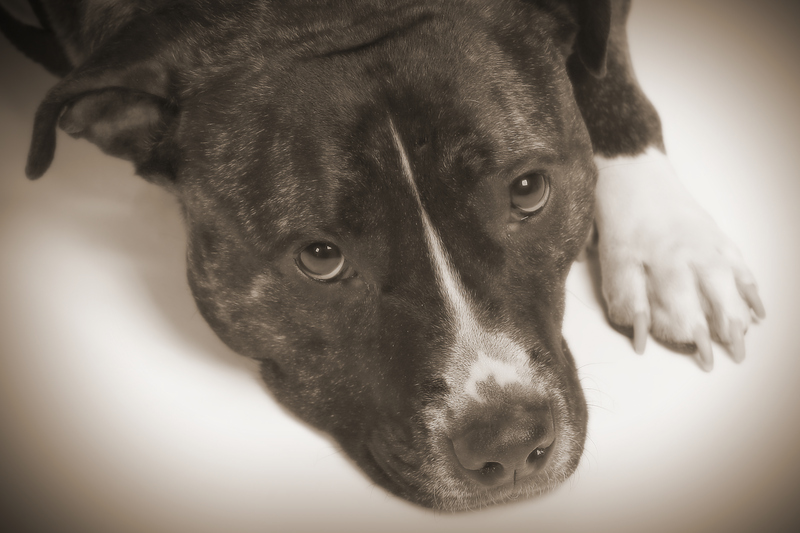 Ruby had found her forever home…. Ruby’s new road…..she goes E! 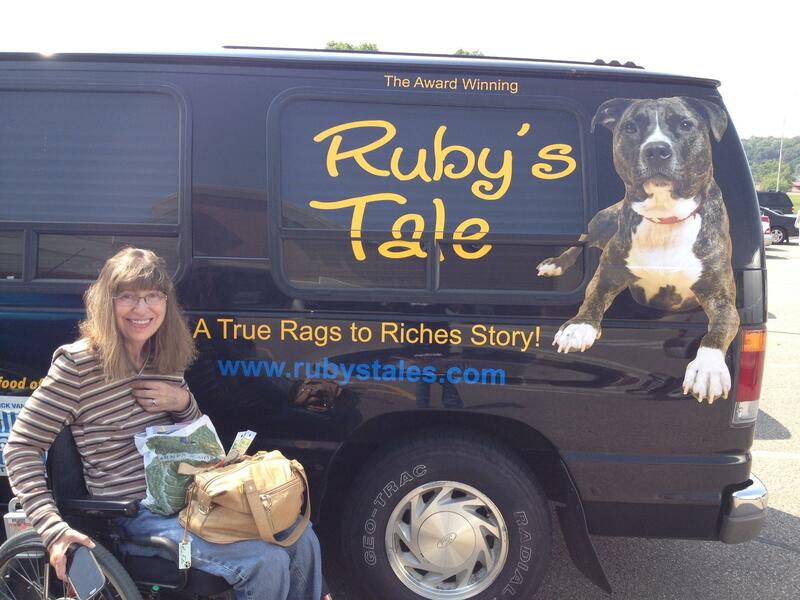 Follow along on Ruby’s most wonderful odyssey that has been her life. She has taken our family along for the ride, and what a hell of journey it’s been! 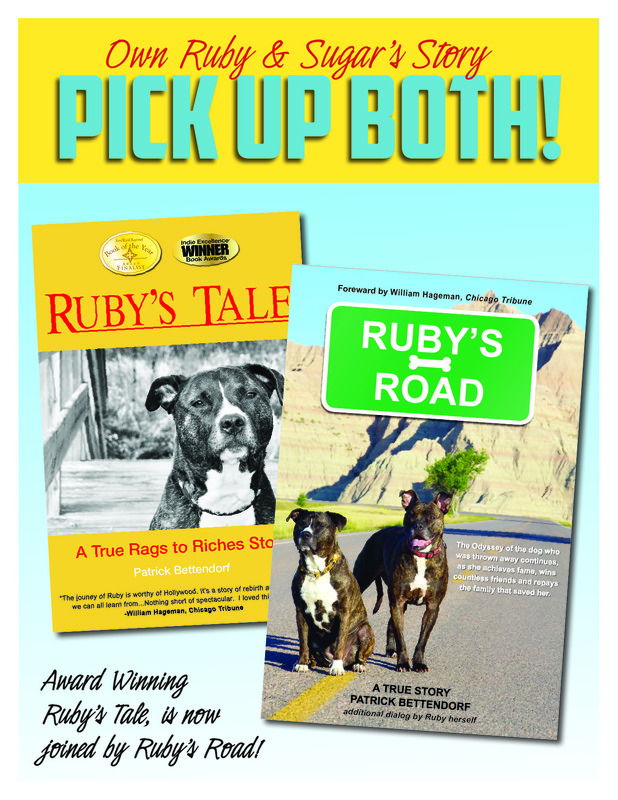 Over the coming days we’ll reach back a bit and bring you along and up to date as her true story continues, Ruby takes a turn as a “professional” actor, wins countless friends in her 72 book signing events, as she travels around around America by commercial airliners and motor homes. She is drawn into an intrigue and a mystery, embarks on more adventures, takes on a protege (“Sugar”), and even excepts an invitation to an Ivy League law school and more. 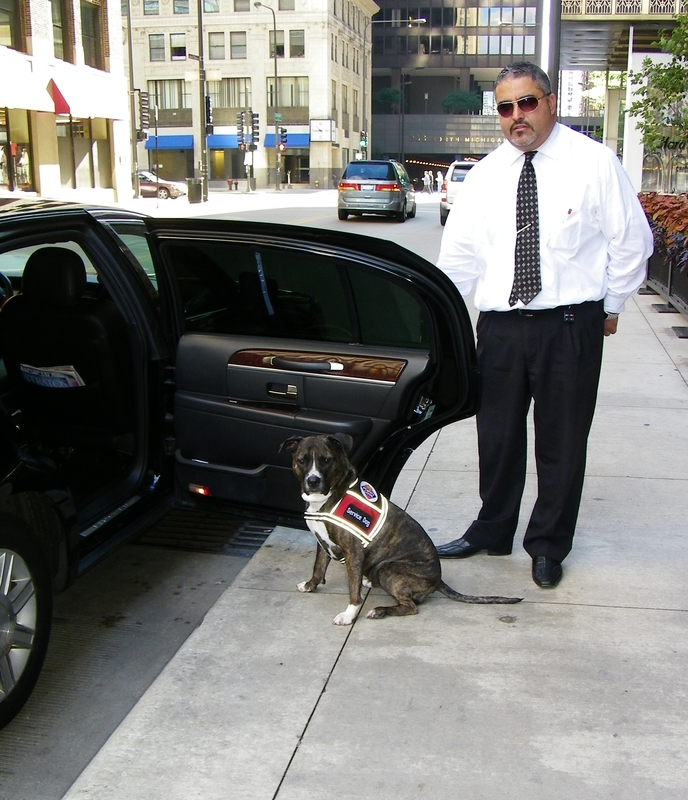 Ruby also works with kids in schools and libraries, special needs children, visits hospice patients, and senior residences. But before I go on too far, let me say this……least you think me a crazed parent to a furry kid. While she does have some outstanding traits, Ruby is not the best dog around. She’s not. But, Ruby may be one of the luckiest dogs. She’s been able to positively touch lives across America and around the world. Thanks for visiting our Blog, come on along for the ride, there’s always room for one more on our Road trip!